Going on a hike with all ages requires extensive preparation. And lots of kiddie backpacks. Some of us take sun protection seriously. We trekked to Lake Mary, above Brighton Ski Resort in Big Cottonwood Canyon. and, on another day, to Cecret Lake, in Albion Basin near Alta, in Little Cottonwood Canyon. Salamanders in the lake were interesting. and a marine fossil rock (at 10,000 feet!) provided diversion. We had an opportunity to learn each other's habits, good and bad. Most of us thought it was all pretty fun. Your new header is just beautiful! I also want to give you the Courage in Action award for hiking with six liddle kids! Que as bençãos de Deus, estejam sempre contigo e tua familia linda. I'm laughing here in CO Janie! I notice the little sun screener shed her garments after hiking. Those are some little ones to take on a hike - you're starting them early, which is great. That Header is awesome! Great family photos Janie. Loved the group photos and the one with the kids where you got them all smiling at the same time is adorable. Loved that header photo too, a stunning photograph!!! It looks as if you had a couple of great hikes with the entire family. Your grandchildren are all adorable (you didn't know that, did you?). I'm glad you could get the family together for such a wonderful occasion. My how the kids have grown- the joys of a family trek will hold many fond memories. The marine fossil rock is incredible. Love your header view. Have a wonderful weekend Janie. É muito educativo as crianças terem contato com a natureza... é a melhor lição de preservação ambiental... parabéns!!!! So great to see families taking their little ones hiking. It's worth all the planning and hard work. And they are adorable. What a happy and healthy looking crew. And what fun for the photographer! Adorable, Janie... I know you were in 7th heaven with the grands around... Are all 6 of them your grandchildren? Wow--I only have 5 (and mine are all grown up now).... Time flies. What a great family and a great expedition. Brought back some memories. I went to a summer camp near Brighton in 1965 and one day we hiked up to Lake Mary. Years later, in the early 90's Heather and I hiked up there also. I love Big Cottonwood Canyon, lots of trails. This is family fun that will be remembered, at least by the older ones in the bunch. Cute kids! It looks like a LOT of fun. I laughed at the nose pickers and the half shirted guy; too funny. What an adorable group of grandchildren! Beautiful pictures. I wonder what you would call a 1/2 shirt tan? Wow, what a gorgeous header image! 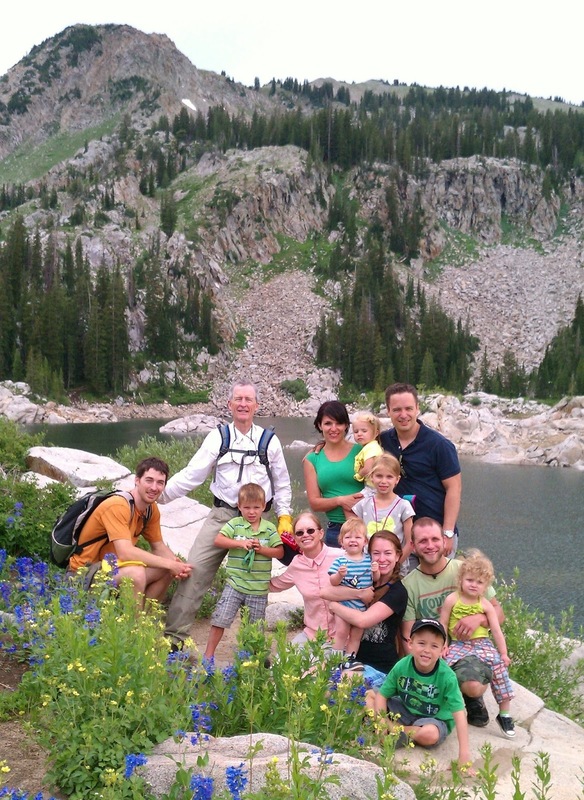 Great photos from your family hikes. The grandkids are sure growing and have such beautiful smiles. The marine fossil rock was quite a find! What a beautiful family, and it how it has grown! Looks like everyone had a good time.